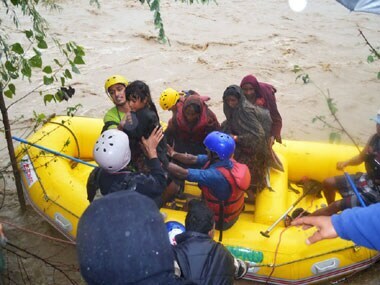 New Delhi: Unprecedented rainfall, unplanned urbanisation and lack of preparedness are the basic reasons behind the floods which have devastated Jammu and Kashmir, a Delhi-based environment research and advocacy organisation today said. An analysis by Centre for Science and Environment (CSE) said the floods could very well be another manifestation of an extreme weather event induced by a changing climate. "It is a combination of an intense and unprecedented rainfall event combined with mismanagement (of drainage) and unplanned urbanisation and lack of preparedness," Sunita Narain, CSE director general, told reporters. CSE said, as was the case with some of the previous extreme rainfall events, the scale of disaster in Jammu and Kashmir has been exacerbated by unplanned development, especially on the riverbanks. "In the last 100 years, more than 50 percent of the lakes, ponds and wetlands of Srinagar have been encroached upon for constructing buildings and roads. The banks of the Jhelum river have been taken over in a similar manner, vastly reducing the river's drainage capacity. Naturally, these areas have suffered the most," the CSE said. Elaborating on the unpreparedness of Jammu and Kashmir in dealing with such events, CSE officials said that Jammu and Kashmir does not have a flood forecasting system and "its disaster management system is also rudimentary". "The Kashmir floods are a grim reminder that climate change is now hitting India harder. In the last 10 years, several extreme rainfall events have rocked the country and this is the latest calamity in that series," said Chandra Bhushan, CSE deputy director general. CSE said its researchers had compiled a list of such extreme events which includes Mumbai floods of 2005, Leh cloudburst of 2010 and the Uttarakhand floods of 2013. "India should start internalising climate change adaptation in all developmental policies and programme. From building of cities infrastructure to agriculture and from water supply to energy infrastructure, we will have to make changes to incorporate climate change impacts," said Narain. "In each of these disasters, thousands have died and the economic losses incurred have run into thousands of crores of rupees," the CSE said. The CSE analysis about Jammu and Kashmir floods further highlighted that there has been "unseasonal and extreme rainfall" and at many places as it rained more than 200-mm in 24 hours –- 400 per cent more than the monthly average. However, CSE said that in these cases of Leh, Mumbai, Uttarakhand and now Jammu and Kashmir, no mention of climate change was ever made by the Indian Meteorological Department and it has rejected it as the possible reason for the events. CSE said that Ministry of Environment and Forests & Climate Change too has "no opinion" on these extreme rainfall events. The think-tank said heavy and very heavy rainfall events in India has increased over the past 50-60 years. "A study done by BN Goswami of Indian Institute of Tropical Meteorology Pune shows that between 1950 and 2000, the incidence of heavy rainfall events (above 100 mm/day) and very heavy events (above 150 mm/day) have increased and moderate events (5-100 mm/day) have decreased." "Most climate models also predict that India will be hit more and more by extreme rainfall events as the world continues to warm in the coming decades," the CSE said. It said that according to the latest analysis by the Working Group II of the IPCC Assessment Report (AR5), floods and droughts are likely to increase in India. India will get more rainfall but in lesser number of rainy days. Increase in extreme precipitation during monsoons has also been predicted. Similarly, IPCC's 2011 Special Report on Managing the Risks of Extreme Events and Disasters to Advance Climate Change Adaptation presenting projections for the period 2071-2100 points to increasing incidents of more frequent and intense heavy precipitation over most regions. Stating that "denial was hurting" more, CSE urged that its time that the country has to accept that climate change is impacting and they are likely to increase in the future. CSE also called for improving forecasting and warning systems, build disaster management capabilities at the local and state levels, and invest in research to understand more how climate change is going to affect different areas and aspects. 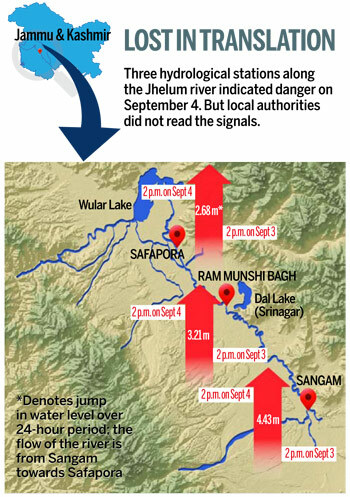 On the afternoon of September 4, two days before Jammu and Kashmir was ravaged by its worst floods in more than 50 years, three hydrological stations on the Jhelum river, which runs through the valley, had detected that serious danger was lurking. Less than 50 km upstream of Srinagar, the Sangam station, operated by the Central Water Commission (CWC), indicated that water levels had risen from 5.7 m on September 3 to 10.13 m on September 4. That's more than the height of a storey in a regular house. The knock-on effect was swift and the alarming rise in water levels was soon detected by two other CWC stations. Nearer the capital, the Ram Munshi Bagh hydrological station registered a jump of more than 3 m in the water level between the afternoons of September 3 and 4. Further downstream, the Safapora hydrological station also recorded readings of a similar jump in the same period (see chart). The information provided by these three stations should have set alarm bells ringing within the state administration which should have then prepared itself for a major flood hitting the area. It could have provided a 24-hour window to evacuate people from lowlying areas, deploy special response teams and to arrange for rationing supplies. Except that none of this happened. The explanation for this inaction is staggering-these CWC stations are not flood forecasting stations. They are merely supposed to monitor the flow of water from India to Pakistan under the Indus Water Treaty of 1960. When they detected the rise in water levels, the information was quickly passed on to the local administration but they simply looked past it, thinking it had nothing to do with flood management. No one bothered to join the dots. Such an episode perfectly encapsulates the malaise that is still affecting India's disaster management systems. More than a year has passed since the Uttarakhand floods that claimed close to 6,000 lives but lessons have still not been learnt. 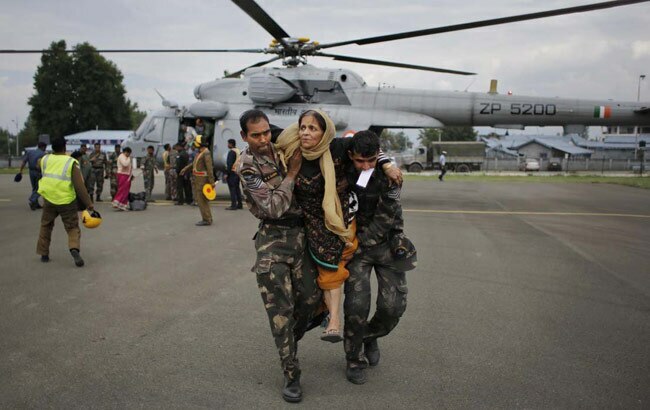 What emerges, in the Kashmir case, is a familiar story of agencies failing to communicate, a lack of planning and awareness and the inability to clear projects and funds meant for the crucial work of saving lives. The first mistake this time was a critical lack of foresight. Despite the fact that Jammu and Kashmir (J&K) is an unstable region highly prone to earthquakes, it appears that no one thought the state could be affected by floods. The National Disaster Management Authority (NDMA) maps for floodprone regions inexplicably does not include J&K despite the National Institute of Disaster Management noting that the state is prone to flash floods. The region was, in fact, ravaged by floods in 1992 and a more serious calamity occurred in 1959. The confusion regarding the role of the CWC starts here. According to CWC Chairman Ashwin B. Pandya, the commission only sets up flood forecasting centres at the request of state governments. It currently does flood forecasting from 175 locations of the 873 hydrological stations across the country. "We have not received any such request from J&K, so our stations there are mostly for hydrological data collection," Pandya told INDIA TODAY. There were other warnings besides the critical information that could have been gleaned from the CWC stations. According to the India Meteorological Department, J&K typically receives about 100 mm of rain in September. Yet, in the first four days of the month, the figure recorded was already 400 mm. Again, there was ample evidence that danger was afoot but this time there was no one to interpret this data and issue a warning. That role is supposed to be performed by the NDMA, headquartered in a plush building in New Delhi's Safdarjung Enclave. Since the NDA Government took office in May this year, it has secured the resignations of five of its members including its vicechairman, thereby rendering the body headless. While there are still technical experts housed in the building, an NDMA official explains that a lack of leadership means that no work has happened there for months now. "Normally the NDMA receives forecasts from the Met department and the CWC, and a team then analyses the data. While natural disasters cannot be predicted, an early warning is possible for floods," the official told INDIA TODAY. The NDMA, however, is not directly involved with disaster management in each state. Its mandate is to frame policy and put structures in place. Disaster management in the states is supposed to be carried out by the state disaster management authority and district disaster management authorities, all of whom are supposed to have incident response teams in place to deal with such situations. Here again, both the NDMA and state government failed. In February 2012, the state government had approved a three-tier disaster management policy but it was never able to create a separate department which would only deal with disasters. The task was assigned to the respective divisional commissioners or deputy commissioners of the area who presumably had several other things to deal with. As recently as May 2013, when earthquakes hit the Chenab Valley in Kashmir, no steps were taken to firm up these plans, a fact noted by the then-NDMA vice-chairman Shashidhar Reddy. "Many states have not come up with the plan yet and Jammu and Kashmir is sailing in the same boat," he said. In the same month, the state's chief secretary Muhammad Iqbal Khanday countered this, saying that the state had adequate infrastructure in place to deal with any kind of disaster. NDMA officials argue that they can only go so far in pushing states to effectively deal with disaster management since it is a state subject. But they insist that state authorities have repeatedly been told about the procedure to follow. "Low-lying areas are to be evacuated and all food supplies are to be shifted to the rooftops. People should be given rations," an official explains. Besides, there were also long-term measures suggested, such as establishing a dedicated disaster communication network using satellite phones. Such a system would have been crucial in Kashmir after all regular communication channels broke down. Last year, the NDMA, along with National Disaster Response Force and the National Informatics Centre, was supposed to procure such a system. That project has been, however, repeatedly stalled after disagreements between the three agencies. In 2011, the Central government had proposed that Rs 250 crore be kept as a response reserve to be given to state governments in case of any emergency. However, the Finance Commission has repeatedly turned down requests for allocation of these funds. More importantly, a unified command system was to be set up under NDMA which would have taken crucial decisions in time of emergency. The ministries of agriculture, defence and home were supposed to be a part of this command and the officials of these ministries even visited Russia to study its incident response mechanism. Still, no system is yet in place. While bureaucratic inefficiency continually undermines the possibility of India having an efficient disaster management system, consider the costs of running the various agencies involved. The CWC has a budget of Rs 173 crore and has about 800 Group-A engineers as part of its 5,000-member strong staff spread across the country. Yet, it only does flood broadcasting for some states by special request. The Central government pays Rs 40 crore every year towards the salaries and perks of the NDMA members and its staff. In the seven years of its existence, the NDMA has spent more than Rs 1,300 crore but is still unable to map flood-prone areas effectively and has only limited power in dealing with state governments. Recent reports indicate that the Government plans to reconstitute the NDMA based on a report authored by P.K. Misra, currently the additional principal secretary to the PM, that plans to make it more efficient. That step would be welcome, but unless there is a more holistic recasting of the roles played by various agencies, the same tangles are likely to continue. To read more, get your copy of India Today here.